There is only one word to describe this dinner: magical. From the moment we left the parking lot and walked into the fairyland that is Tangled Garden, we were spellbound. We were greeted by one of our hosts, Lisa Boehme, as soon as we walked through the gate. She gave us a quick tour of the retail space and our “dining room” and then sent us off to explore the expansive and mystical gardens on our own. Before entering the rest of the garden we stopped and chatted with Alexandra, the representative from Benjamin Bridge Winery who supplied all the wine for our dinner. As we moved along, exploring the natural beauty around us, we again met Lisa – suddenly materializing out of a beech hedge – who presented us with delicious French 75 cocktails. After a few moments more of exploring and sipping our cocktails, a gong summoned us back to the dining area. We were met there by our other host, and Tangled Garden owner, Beverly McClare. Beverly instructed us to follow the fiddler (well-known local musician, Tony Napoli) through the garden. Just that experience alone – a trail of eager and curious diners unquestioningly following Tony to…what? We were about to find out. 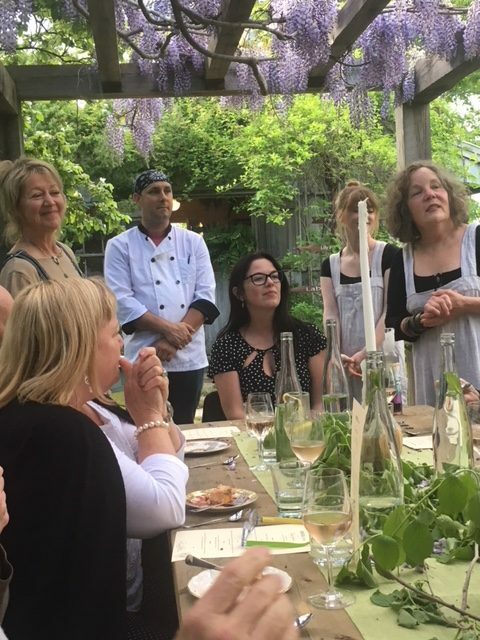 Beverly gave us quick lesson on the versatility of lovage and then we were offered a delicious canapé of sausage, olive, and lovage. Delicious. Then off we go, following Tony again, to another part of the garden – this time to gather around the goldfish pond. 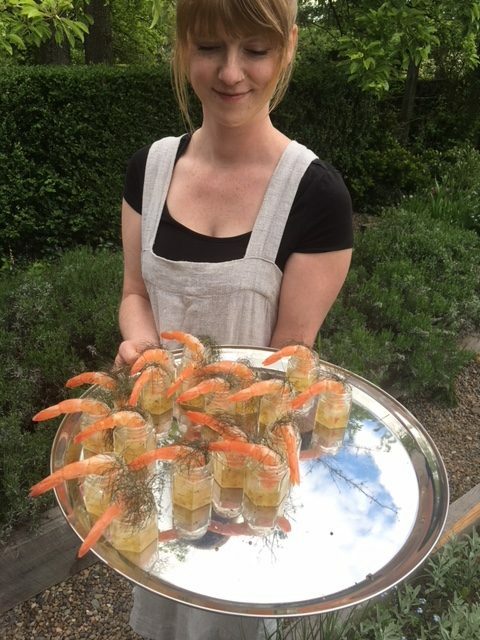 Once there, another host, Keely, presented us with another spectacular canapé, this time grilled shrimp presented in a tiny jar of herbed gin jelly with a sprig of bronze fennel as garnish. Amazing. 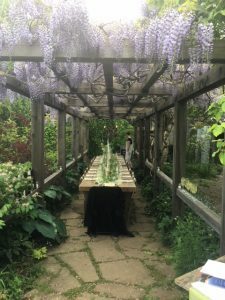 Then it was back to our wisteria-draped dining room to begin our dinner. The incredible and delicious menu was created by Mark Merrin, who came out and introduced each course to us as we went through the evening. This was my first time dining with Mark but I’m sure we’ll see more of this very talented individual in the future. 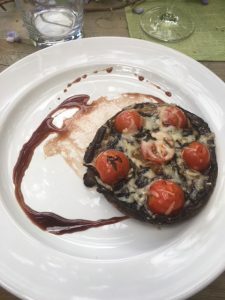 We began the evening with portobello mushrooms filled with tomatoes, fresh garden herbs, and Gruyère cheese. The firm meat of the fresh mushrooms made for the perfect stage for the tomatoes and melted cheese. I was already looking forward to the rest of this dining experience. The Benjamin Bridge NV Brut was a spectacular opening act for the wine pairings. Where many wines will highlight a specific vintage or year, the non-vintage NV Brut works to create a representation of Benjamin Bridge’s own microclimate and terroir. The earthy minerality of the NV Brut was the ideal choice to present with the rich roasted mushrooms smothered in Gruyère. 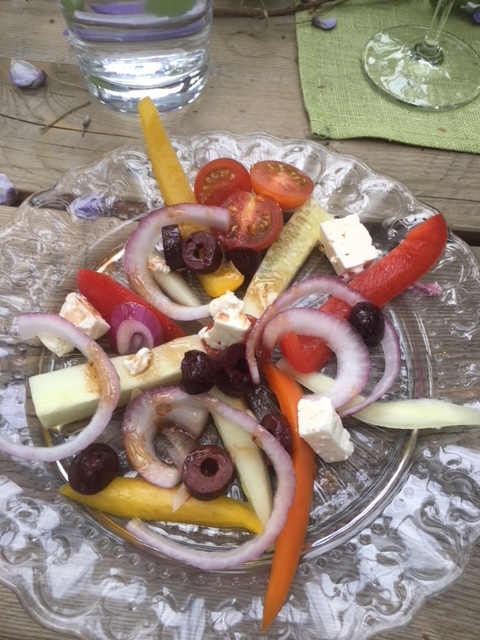 Next up (or, Act 2 as it was presented to us on our menus), we were treated with heirloom peppers, cucumbers, tomatoes, and feta drizzled with Tangled Garden Blackberry Bliss Vinaigrette. This fresh and colourful dish was brimming with spring flavours that were pushed over the top by the spectacular vinaigrette. I’ll definitely be visiting their retail shop soon to procure some to have at home. The Benjamin Bridge Reisling was the pairing for this course and, as before, Alexandra was right on the mark. The dry style white wine stood perfectly beside the fresh vegetables and tangy vinaigrette. Act 3 was Rosette di Pasta layered with four cheeses and prosciutto presented on slow-roasted tomato sauce. I’m not sure if it’s the slow roasting that gave the tomato the kind of flavour we experienced but it was incredible. The perfectly cooked pasta with the rich cheese and prosciutto filling nestled in the flavourful tomato sauce was certainly a highlight of the dinner. The Benjamin Bridge pairing for this course was their version of our appellation blend, Tidal Bay. Visitors and local alike are generally thrilled with any of the local Tidal Bays but Benjamin Bridge’s offering was fantastic and especially perfect for the pasta. The Finale of the evening was well worth the wait. Those of you who have read my articles before will know I have a sweet tooth. In my considerable dining experience I have tried a lot of cheesecake. A lot. The New York Style Cheesecake with fresh berries and Tangled Garden Raspberry Liqueur may have been the best I’ve ever tasted. I don’t make a statement like that lightly. The fresh berries and the silky cream cheese were a nice combination but if I had to guess what made this cheesecake stand out so far above the rest, I would speculate that Mr. Merrin utilized very good vanilla in his cheesecake mixture. Or maybe there was just a hint of lemon. That’s only a guess. Maybe the secret ingredient was the magical setting we were in. Benjamin Bridge was up to the pairing with the ever popular Nova 7. This refreshing sparkling wine was just sweet enough to easily make a perfect match for the delicious dessert. 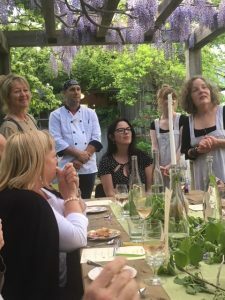 And just when we thought there couldn’t be any more fantastic surprises, we were led to the Tangled Garden Tea Room where we were offered coffees, lattes, espressos, or herbal teas, along with a homemade tootsie roll. This little building in the middle of the gardens is as magical as its surroundings. Sipping my coffee from my antique tea cup, I couldn’t help but smile at the trailing vine that was reaching in through the open window and round the beams as if it wanted to enjoy the tranquil atmosphere of the little tea house too. The Unpredictable dining experience is just that, unpredictable, but I can easily predict you will never be disappointed. You can also enjoy the splendor of these Tangled Gardens any time they’re open and have a tea or coffee and a treat in the tranquil setting of the tea house. Without hesitation I can tell you that Tangled Gardens and Unpredictable Dining are two of the Valley’s treasures. Treat yourself and enjoy either or both of them soon. But don’t hesitate, the Unpredictable dinners have limited seating and they fill up quickly. Cheers.